Michael Haneke's 'Amour' might be set for this year's Best Foreign Language Oscar, thanks to its string of other nominations, yet fellow nominee 'No' could prove to be its most significant challenger. 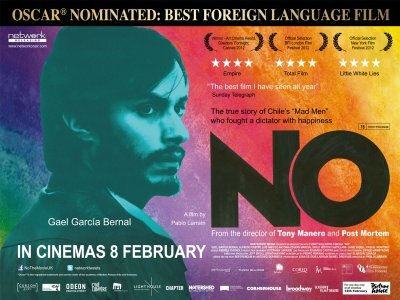 Set in Chile during the late 1980s, 'No' stars Gael Garcia Bernal as an ad executive who unexpectedly finds himself at the heart of a generation-changing political campaign. Chile's 1988 plebiscite was a landmark referendum to decide the future of their country - whether they would continue with the dictatorial rule of General Pinochet or vote against Pinochet and opt for a more democratic path. The vote was so pivotal to Chileans that an incredible 97.5% of the population turned out to vote. Bernal finds himself working against his own pro-Pinochet employers, amid intimidatory tactics that threaten to derail the democratic marketing campaign. This fear and tension is aptly caught by director Pablo Larrain, who made a brave but rewarding choice to shoot the film in a suitably retro fashion - its grainy look superbly executed in tandem with cinematographer Sergio Armstrong. 'No' may not come away with any Academy Awards but it has already succeeded in bringing a significant period of Chile's history to a wider audience. It equally succeeds as a filmmaking exercise. A well balanced drama, unafraid of the occasional (and most welcome) comedic touch, despite the importance of the subject matter. 'No' is out today in UK cinemas, through Network Releasing. The film premiered in the UK at the BFI London Festival 2012.